SIVAGNANA BHODAM ON RAHU AND KETU. Rahu and Ketu are the last two of our nine planets Puranically, they represent respectively the Head (Caput Draconis) and the Tail (Cauda Draconis of a Dragon an Asura who, having stealthily partakes of the Ambrosia intended only for the Suras or gods, was struck by Vishnu, on the complaint of the Sun and the Moon. The ambrosia, however, having made him immortal, his Head and Tail have survived, and in the Heavens, avenge the fatal blow on the Sun and the Moon by means of Eclipses. But what we are able to understand better is the account given of them in Astronomy. Astronomically, they are respectively the ascending and descending nodes of the Moon, being two imaginary points where the orbit of the Moon in its revolution round the Sun intersects what is called the Ecliptic. The Ecliptic, though really the orbit of the Earth round the Sun, is practically the apparent annual path of the Sun in the Heavens and is the central portion of the zodiac. The path of all the planets in the Heavens constitute the zodiac which is divided into twelve parts named after the constellation situated in each. The Sun moves along the central path of this Belt within which all the planets move. For all practical purposes of Astronomy, it is convenient, as our Astronomers have done, to regard the Sun as moving in the Heavens though the motion is caused by the revolution of the Earth. This apparent path of the Sun in the Heavens called the Ecliptic is intersected in two points by the Moon in its revolution with the Earth round the Sun, that is to say, the Moon in its course crosses the Ecliptic at two points; but in the other parts of its course, it is away from the Ecliptic but never at it. When the Sun and the Moon are in conjunction at any point in the zodiac, we know we have what is called the new Moon. But when this conjunction takes place at one of the two nodes above mentioned viz., at either Rahu or Ketu point then a Solar Eclipse occurs – that is the Sun and the Moon being then visible to us nearly on the same line, a portion of the Solar disc is intercepted by the body of the Moon. But on the other hand, if the Sun and the Moon are at opposite points in the zodiac, we have what is called the Full Moon and when this Full Moon occurs while the Sun and the Moon occupy these two opposite points respectively viz., the Rahu and Ketu points, even then they are on the same line with the Earth but on different sides of it and the Moon therefore merges into the shadow of the Earth caused by the absence of Solar light. And we then have the Lunar Eclipse. As these curious planets are two mere imaginary points at which the path of the Sun and of the Moon meet each other, we are unable to identify their position at ordinary times though they are always, as marked in the Calendar, situated exactly opposite each other separated on either side by fire signs of the zodiac and are ever moving through the zodiac like the other planets at 18 months per sign of the zodiac or Solar mansion. For the purpose of determining the Eclipses, it is necessary to know the position of these points and they are therefore marked every year in the Calendar and assigned to a particular Solar mansion in the zodiac. சிவஞானபோதம் in the following stanza by way of a simile for illustrating a difficult Theological principle which could not otherwise be explained. "The imperceptible Rahu and Ketu become perceptible during Solar and Lunar Eclipses. So God becomes visible in the Heart by the devise of Panchatchara like fire in a wooden rod subjected to friction, and the Soul becomes merged in Him losing its individuality like heated iron. Therefore practice Panchatchara." In another place in the same book, we have the following stanza introducing another rare Astronomical truth by way of simile. "The planets lose themselves in the light of the Sun but are unlike him though they shine by his borrowed light. So the senseless derive their power of perception from Him who also perceives through them and is identical with them." கூறாயினார்' as Ketu is an imaginary planet, it is not separately mentioned. யாயிற்று' as the Vedas hold that the lights of planets is derived from the Sun, it is here used as a simile. These two similes borrowed from Astronomy point to the profound erudition of the author in other branches of Science than Theology, for it us very unlikely that an author of his reputation being the first classical Tamil writer on Siddhanta Philosophy in a work like சிவஞானபோதம் would have used for his similes, facts which he has not thoroughly mastered unless we suppose they occurred in the original Sanskrit Text. &c. to a lamp in physical darkness and that of the perishable character of the Universe to a mirage. The similes of this author are very apt and instructive and require to be carefully studied. 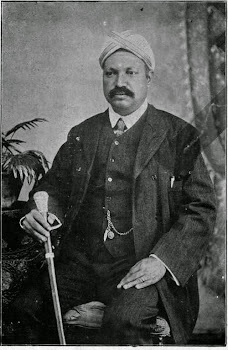 T. VIRABADRA MUDALIAR, B.A., B.L.